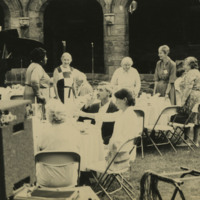 Photograph of what appears to be an outdoor luncheon. Reunion attendees are sitting outside (some standing) over a table as refreshments appear to be served. Inscription on back states "from the papers of Mary Helen MacCoy '00."